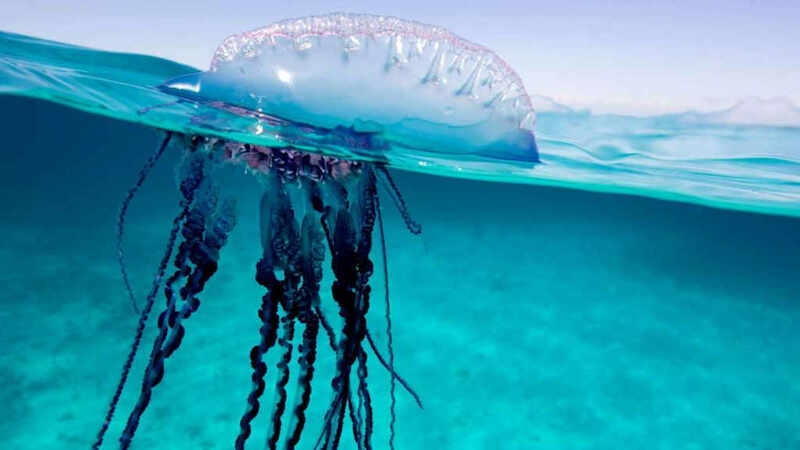 What are the Portuguese man o’ war found in the Caribbean and why are they dangerous? At first glance, the Portuguese man o’ war (fragatas portuguesas in Spanish) can be striking and even beautiful to observe, but it’s best to keep a safe distance and never, ever, under any circumstances, touch any. Their appearance is deceptive. The Physalia physalis is a marine hydrozoan of the family Physaliidae found in the Atlantic, Indian and Pacific Oceans. Its long tentacles deliver a painful sting, which is venomous and powerful enough to kill fish or, rarely, humans. Despite its appearance, the Portuguese man o’ war is not a true jellyfish but a siphonophore, which is not actually a single multicellular organism (true jellyfish are single organisms), but a colonial organism made up of specialized individual animals (of the same species) called zooids or polyps. How did they get to Costa Rica’s Caribbean beaches? The strong winds of the past days and the swell, have caused that the also called false jellyfish arrive to Costa Rica’s Caribbean coast. 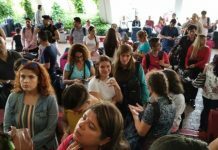 Their presence motivated a call of warning on the part of the Centro de Investigación en Ciencias del Mar y Limnología (Cimar) – Center of Investigation in Sciences of the Sea and Limnology – of the University of Costa Rica (UCR). This species have tentacles that store toxins that are used as a defense mechanism and also in order to catch the prey. One of the problems with identifying these stings is that the detached tentacles may drift for days in the water, and the swimmer may not have any idea if they have been stung by a man o’ war or by some other less venomous creature. Detached tentacles and dead specimens (including those that wash up on shore) can sting just as painfully as the live organism in the water and may remain potent for hours or even days after the death of the organism or the detachment of the tentacle. Stings usually cause severe pain to humans, leaving whip-like, red welts on the skin that normally last two or three days after the initial sting, though the pain should subside after about 1 to 3 hours (depending on the biology of the person stung). However, the venom can travel to the lymph nodes and may cause symptoms that mimic an allergic reaction including swelling of the larynx, airway blockage, cardiac distress, and an inability to breathe. Other symptoms can include fever and shock, and in some extreme cases, even death, although this is extremely rare. Medical attention for those exposed to large numbers of tentacles may become necessary to relieve pain or open airways if the pain becomes excruciating or lasts for more than three hours, or breathing becomes difficult. Instances where the stings completely surround the trunk of a young child are among those that have the potential to be fatal. According to Jeffrey Sibaja Cordero, Cimar investigator, speaking to La Nacion, the fragatas portuguesas are normally found in oceanic waters, so it is not uncommon to see them in the Pacific, but they can also be present in the Caribbean. “What happens is that by winds and waves, they are taken to the coast and to the beach,” said the expert. “This is where this situation (presence in beaches) occurs , since they can be in very shallow waters, where people are bathing or in the sand on the beach, that is what would could happening right now, according to reports from people,” he added. 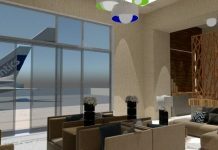 Sibaja said that this proximity to the coast is not rare, it happens from time to time. For his part, Dr. Yayo Vicente, from the Directorate of Health Surveillance, of the Ministry of Health, confirmed on Sunday they received photos of these organisms on the beaches of Cahuita. “We were very worried, first because we did not know of their presence in the country. 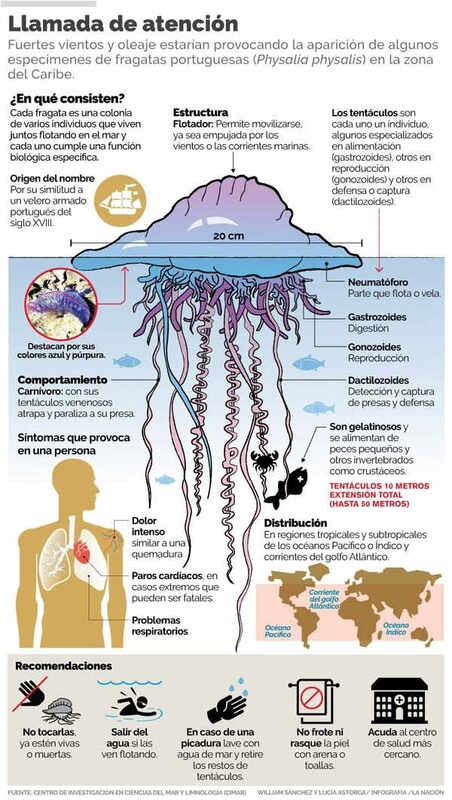 This type of ‘aguamala’ (medusa) is more frequent in the Pacific, in warm waters and we did not know they were present in the Caribbean,” Vicente told La Nacion. So far, the Ministry of Health has no record of anyone who has been affected by coming into contact with any of these complex organisms. 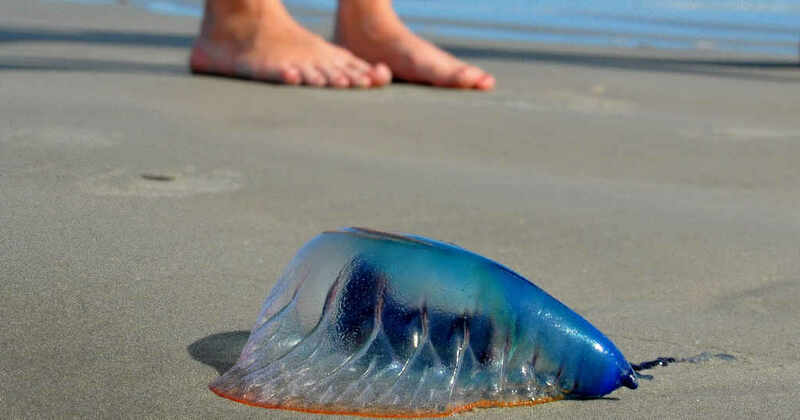 Stings from a Portuguese man o’ war are often extremely painful. They result in severe dermatitis characterized by long, thin, open wounds that resemble those caused by a whip. These are not caused by any impact or cutting action, but by irritating urticariogenic substances in the tentacles. Treatment for a Portuguese man o’ war sting usually begins with the application of poured salt water to rinse away any remaining microscopic nematocysts. Salt water should be used as fresh water has been shown to cause nematocystic discharge. The Portuguese man o’ war is a carnivore. Using its venomous tentacles, a man o’ war traps and paralyzes its prey while “reeling” it inwards to the digestive polyps. It typically feeds on small marine organisms, such as fish and plankton.